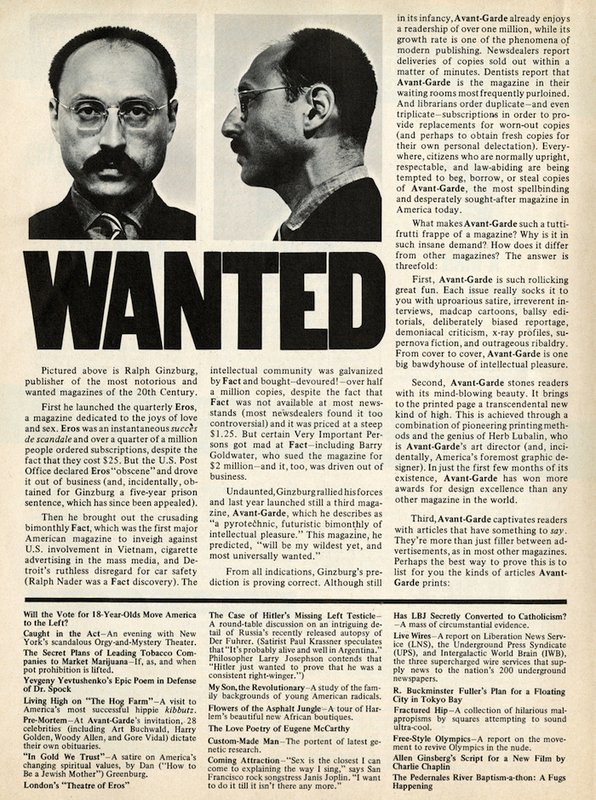 It was not difficult for Ralph Ginzburg to look like an arrested pornographer in the 1968 advertisement titled “Wanted.” He was, afterall, convicted of violating a Federal obscenity law by using the mails to promote Eros, the hardcover magazine that celebrated love and eroticism, and he would eventually serve eight months in a Federal facility as punishment for his crime. By his own admission, he published the most controversial, taboo-busting magazines of the twentieth century and, by my estimation, authored some of the most provocative text-driven promotional ads of any century. He was a brazenly committed pitchman for his landmark publications, two of which, Eros and Fact, were driven out of business by the legal system. Meanwhile, the newer, no less risqué Avant Garde was gathering its circulation. Ginzburg mastered the grit and bravado of direct advertising. 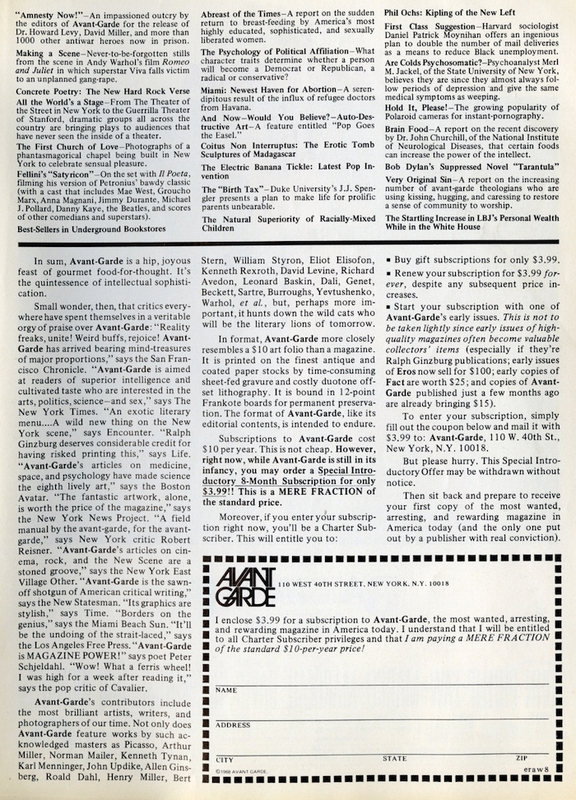 His full- and double-page advertisements like “Wanted,” weighing in at over 4000 words, was similar to the way crowd-sourcing is used today: to generate interest and harvest subscription dollars, often in advance of publication. “Wanted” is decidedly one of his most compelling ad concepts. Great post, Steven. Good to see RG being discussed. He was an important, if problematic character in 60s and 70s America. A true anti-establishment figure. And through his work with Herb Lubalin, he was also a great patron of graphic design. When I was working on my Lubalin book (plug, plug) I discovered something interesting about their relationship. Herb’s widow Rhoda told me that when Ginzburg was jailed for sending Eros (an 'obscene' publication in the eyes of the US authorities) through the US mail, Herb said to her: ‘I should have gone to jail, too.’ What this shows us is that Ginzburg and Lubalin worked as equals on the three publications you mention - Eros, Fact, and Avant Garde. Clearly Lubalin the art director felt as culpable as Ginzburg the editor.